Materiales utilizados: organza de seda y cinturón de pedrería. El vestido es una rosa, llena de pasión y delicadeza. Hecho con la mejor seda, el vestido recuerda el gusto por el vestir de la nobleza europea. El escote en V deja espacio para lucir una joya importante. La cintura ajustada y las hombreras marcadas, favorecen la silueta. This dress is like a red rose, full of passion and delicate at the same time. The amazing organza pattern shows a gala dress that once more recalls the European royalty and is made of the best silks. The open V-neck falls down showing a feminine woman and leaves space for an important jewel to be shown. 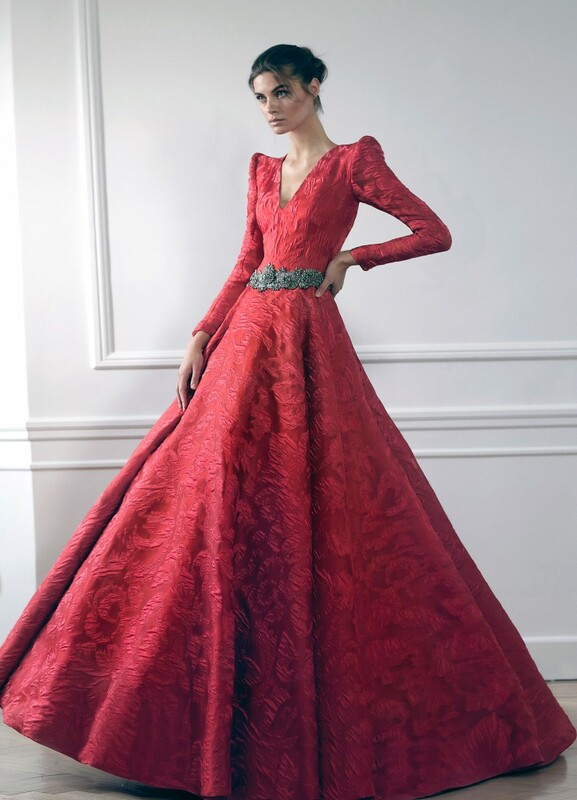 The fitted waist marks the female form and combines with tasteful fitted sleeves and significant shoulder pads that crown the dress with much taste.